Every business, whether made up of a small local team or a multi-national group, must be willing to embrace change. This is part of the success of the best organizations. Every company starts somewhere and it’s change that is the catalyst for growth and innovation. Traditionally, the area of human resources has been somewhat resistant to change. This is due to the complex and unpredictable issues that people can create in organizations. For example, a shift in leadership happens and it can throw things off for quite some time. Human resource leaders must be prepared to help their organizations navigate changes, and they are in a unique position to do so. Technology is in a continual state of evolving and much of this technology is focused on business data. HR must be challenged enough to improve the way business is done based on concrete data gathered from many sources, in order to take a seat at the decision-making table. Developing proficiencies for analyzing and managing data has become paramount to success in the HR career. Data is based on facts, therefore it is considered to be accurate. It helps company leaders better understand their business on another level, while providing insight into deeper aspects, such as employee engagement and productivity — which can be difficult to track otherwise. Most importantly, data is used to create and manage change. This is far better than the alternative of reacting to change and “putting out fires” all the time. It’s understandable that change can be intimidating and there can be a degree of resistance coming from previous generations of leaders. “Why reinvent the wheel?”, comes to mind. Shifting from traditional methods of doing things takes a new mindset. Up and coming human resource professionals should be fully prepared to explain the value that new technology can have, including how it can positively impact the bottom line. This is how to get old-school thinkers to pay attention and get on board with change. Leaders have begun to expect HR to take a more active role in implementing new strategies that can make the business more productive and profitable. They know that HR has the knowledge and ability to make this happen. To support this goal, human resource professionals need the right tools. This can include software tools that manage data in real-time, rather than relying on outdated methods. Now, we know what you are thinking. “Great, something else I need to learn how to use.” It’s natural to worry about trying a new HR tool. There are so many new products out there on the market it can be confusing to choose the right one for the task. Let’s make it easy on you by introducing one you may try for free as soon as you get done reading this article! Thymometrics is offering a completely free version of their globally-recognized always-on employee engagement platform, for up to 25 employees. We can assure you that it’s extremely simple to set up, there is no extra work to administer it, and you will get actionable results and insights within a few days. There are even visual reports and resources that can help you predict the future outcome of your organization (based on trends). Think of it as your own crystal ball that will help you to avert any possible crises. How’s that for looking like an HR hero in front of your colleagues? Learn more about this great opportunity to try Thymometrics always-on engagement at no cost. Find out how always-on employee engagement can help you become an HR hero – no cost, no risk! Get Thymometrics free forever here. 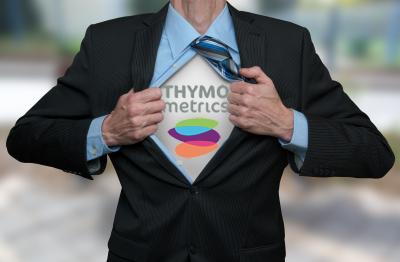 You can always email us at info@thymometrics.com, call us +1 646 760 9323 (US) or +44 (0) 1223 750 251 (Europe) or visit thymometrics.com for more information.